@thedarktangent: Looks like the latest bind 9.11.b1 dies every few hours, process killed due to lack of swap space, all previous versions didn't do this. What do they call software that is updated but contains bugs or problems introduced due to poor QA? 9.11.0b2 is out. But does it fix it? 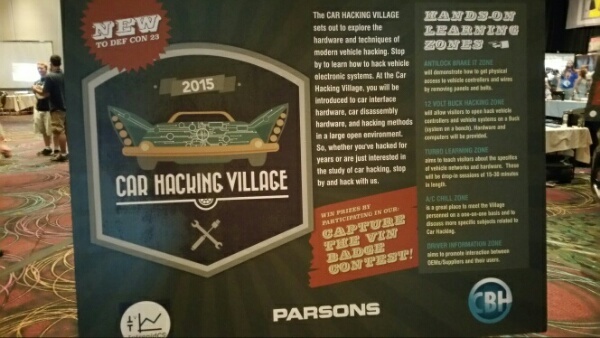 A new section added this year was the Car Hacking Village. There were talks, live demos, hands on hacking and most of all, 2 cars available to test with or on. I saw people really digging into what looked like a Chrysler/Dodge as well as one car that peaked my interest. the logos were masked over but it clearly looked like a Toyota 4 Runner. The first vehicle had door panels off, people hooking up various devices and quite a few interested people in this technology. This is awesome! As we read recently all the news about remote hacking of vehicles, there it was in the flesh (or metal) to play with. Did I get a chance to play? There were a few lines as well as a lot of people gathered around to listen and also to play. i think it best said that it was something I am interested in, but to me it is a slippery slope that I don;t want to hack my car and break the warranty. So as things would have it, sometimes while in Las Vegas or even at DEFCON, you have to use the facilities. I walked into one such facilities at Ballys and while finishing my business at the stand up receptacle, a bunch of loud partying guys (hackers?) walked in. I passed them on my way to the wash basin to wash my hands. 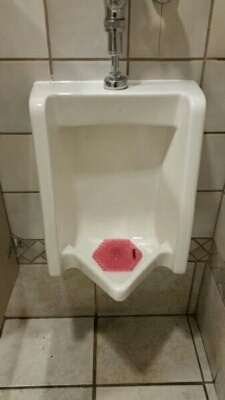 I noticed that one guy stopped to wash his hands, another went to the stand up receptacle, another into the sit down stall and 2 were just hanging out. (since when do guys act like girls and have to have at least 3 or 4 joining them in the bathroom?) Well here they were making loud obnoxious noises and laughing at the top of their lungs. I dry off my hands and hear behind me a loud BANG followed by more laughter. It seems the stand up guy at the stand up booth fell over and took the wall with him, leaving an arch of fluid down to the floor with him. As they laugh and carry on, and other BANG happens. This time the guy in the sit down stall falls off the toilet onto the floor laughing so hard, but wait! He somehow lodged himself between the wall and toilet unable to move. More laughter follows. On the way out of the bathroom, I stopped and barked "HEY!" to which all stopped and got real quiet. I then blurted out "Keep Calm and Pee On!" Laughter and hilarity followed and I walked out the door. Bottom line, I think they were trying to hack the bathroom. At some point in time, we all have to use the facilities for another reason. As I was sitting there, I noticed the toilet paper. 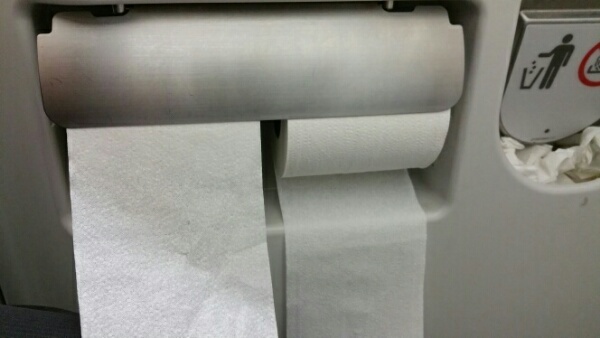 It seems to me that instead of annoying someone who likes their paper over the top or from underneath, the manufacturer came up with a dispenser to keep both sides happy. Now I ask you, while it is an age old argument, does it really matter if you really have to go ? I think the most important aspect is that there WAS paper! That to me is more important than arguing about over or under. But? does this matter to you ?